Welcome to Sky Valley is the name of the third studio album by the band Kyuss (Josh Homme, Queens of the Stone Age. Big fans.). The original name of the album was Pools of Mercury, but somewhere along the line, loyal Kyuss fans began calling it Welcome to Sky Valley and it stuck. It is a pillar of the desert rock sound, of heavy, antithesis-grunge, stoner fusion garage rock, born from having to find one’s own fun in the searing heat and parched, isolated pocket of Palm Desert in Southern California. It is dark, driving rebel rock that brings together funk, punk and psychedelic musical influences, too, kind of where Ian Astbury (The Cult) might meet Black Sabbath. From the blaring sun and dry earth come beautiful heavy metal with a sinister-sweet little album title. Welcome to Sky Valley, it says. Looks can be deceiving. Sky Valley isn’t really a town or city. It is a census-designated place — about twenty-four square miles of land directly in the middle of the foothills of the Coachella Valley. It is surrounded by Joshua Tree National Park and Desert Hot Springs to its north, by Palm Springs and the Salton Sea to its south, the San Jacinto and Santa Rosa Mountains to its west, and the Sonoran desert to its east. In order to arrive at Sky Valley from the coast, one drives through the stunning San Gorgonio Pass along gargantuan, 11,500-feet-tall San Gorgonio Mountain — the tallest in Southern California — via I-10, through the seemingly endless field of wind turbines to find Dillon Road, a road so eerily devoid of modern infrastructure or human presence that it can make one feel as if she has taken a wrong turn. 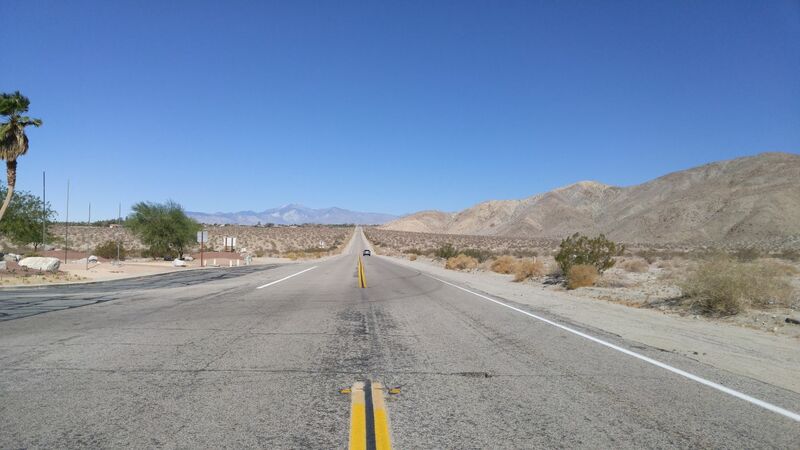 For twenty or so miles we drove through nothing as we slowly climbed the foothill that led us past turnoffs to Palm Springs and Desert Hot Springs, to the Airground Combat Center at Twentynine Palms or to Joshua Tree National Park. We drove and we drove. Sill nothing. And then all of a sudden, an oasis of small mobile homes and palm trees, patches of grass, an occasional golf cart, a fountain, a pretty sign and then … nothing. But then suddenly something else, this time a tiny sign telling us that we had reached Sky Valley, but there were no people, and it made no sense. It was like an illusion. Finally, we reached the oasis that was ours for a few days, a place that sprouted out of the dirt and seemed so out of place that it made me wonder what the hell we were doing out here. It was very hot and super quiet, so much so that the wind seemed obnoxiously loud. 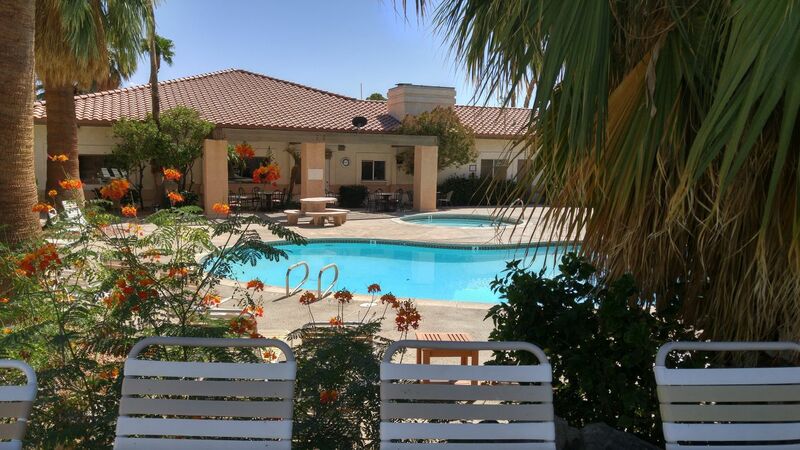 Snowbirds hadn’t arrived yet, but they would be coming soon, so we were told, to Sky Valley, this census-designated place, existing only because it is a retirement community on top of a hill in the desert, surrounded by brown mountains and valley forever. Nine months out of the year, it is the place to be. 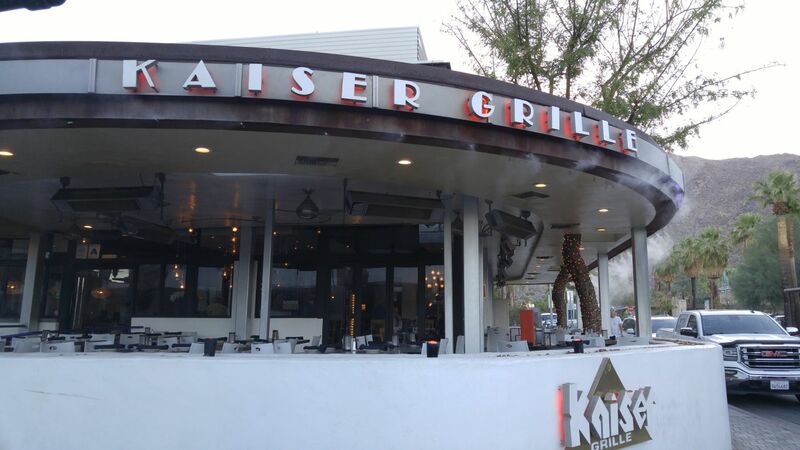 For the diehard, it is a their year round place, all 120-plus degrees of it come summertime. It was like nothing we had ever experienced. What we were seeking was a place to camp for a few days, capping our mini Southern California vacation while traveling en route to Arizona. 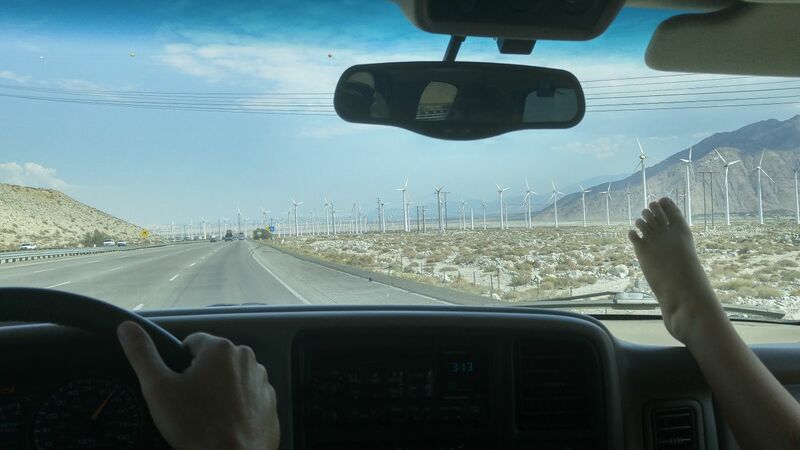 We hoped to visit Joshua Tree National Park and take a peek at Palm Springs. As it turns out, the Palm Springs area is heavy with snowbirds and, thus, many age-restricted communities. 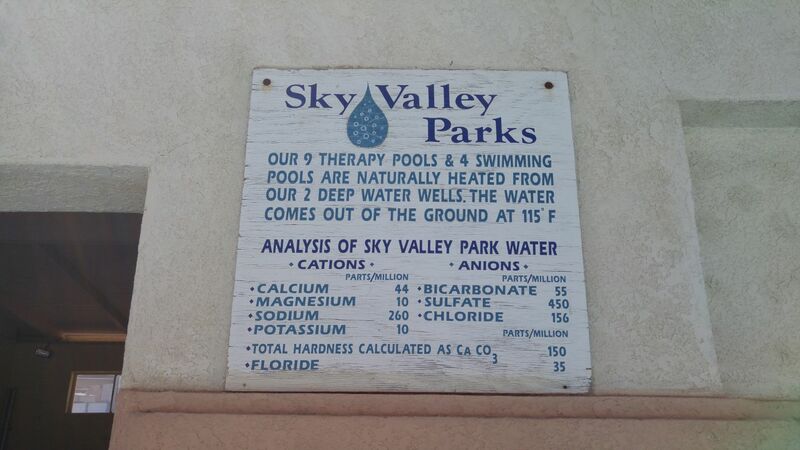 What we found instead was Sky Valley Resort in Desert Hot Springs, which accepted families with children. What lured us to stay with them were the natural springs that fed the pools in the resort. Still in vacation mode, dipping in naturally spring-fed waters sounded pretty cozy, so we took the bait. 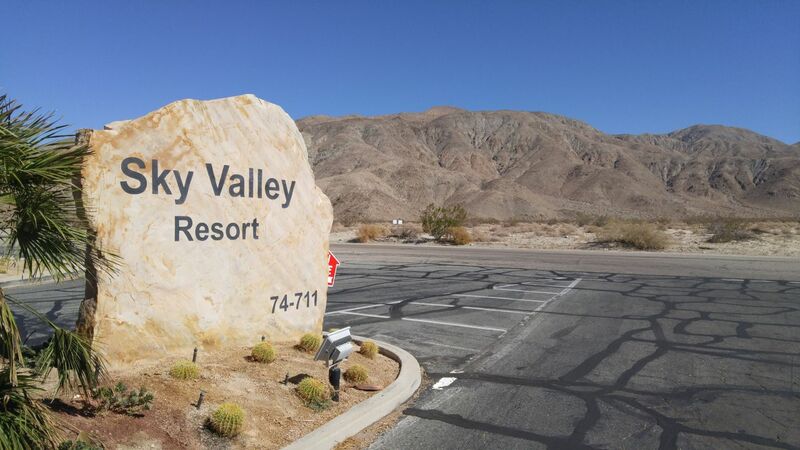 Sky Valley Resorts are super happy, Christian-based communities that came about when the entrepreneurial Mathieu family headed to Palm Springs in the 1950s to escape the Midwest winters. 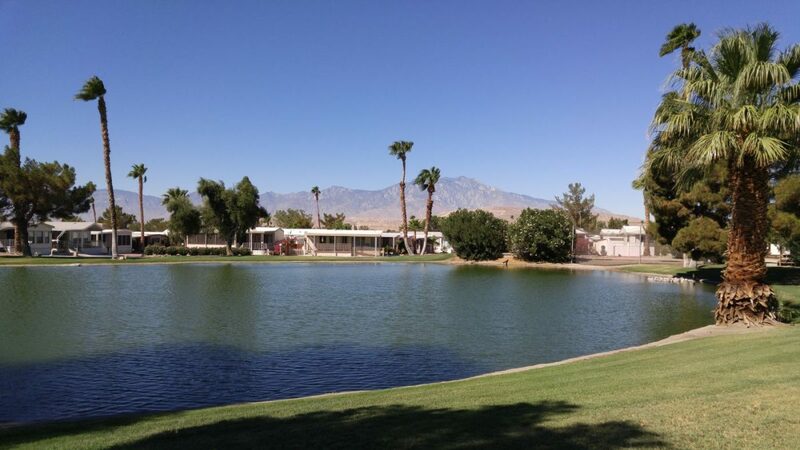 By 1970, son, Tim, built an RV park with an awareness that many folks were enticed to the Palm Springs area for better health and better living. It wasn’t until the famous underground springs were tapped that the resort really found its legs. Today, there are two Sky Valley Resort communities covering more than 160 acres, including 270 homes for rent or for sale, as well as 1,400 RV sites, fine dining establishments and olive trees. Clean and cozy, it was easy to see why so many people call this place home. They are most definitely oases in the desert. 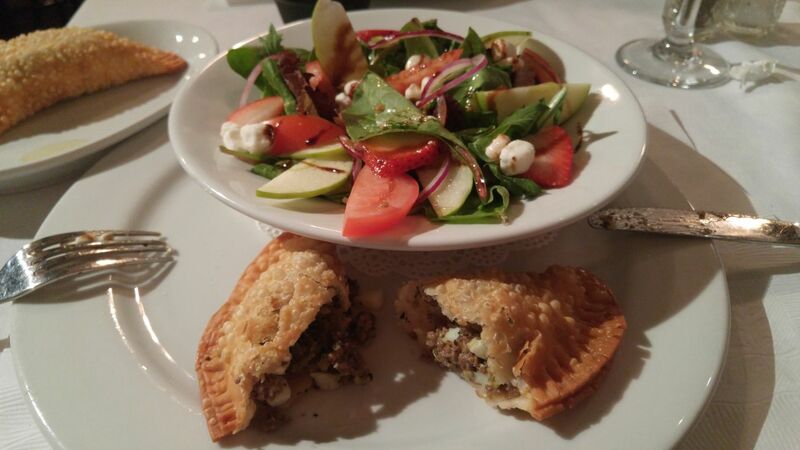 Homemade empanadas by the Argentine chef at Mignon’s at Sky Valley. 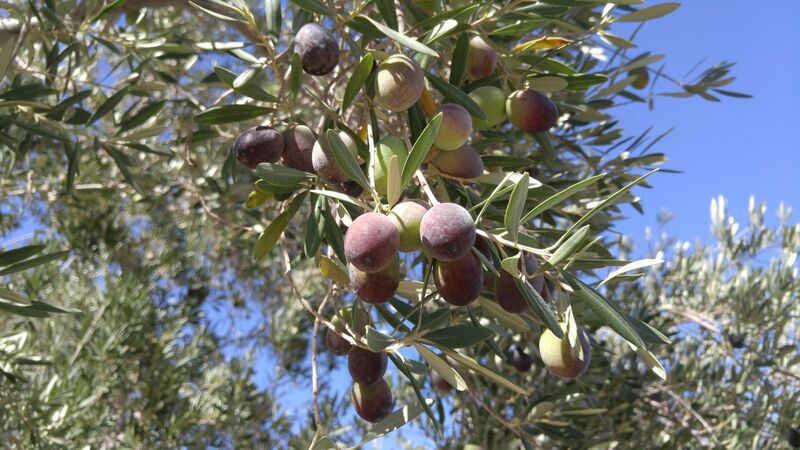 Surprising and beautiful olive trees. Sky Valley Resort, Desert Hot Springs, CA. The spring-fed pools make this so. Swimming in mineral waters was new to us, and it was a really warm and fuzzy experience. Many times we thought that we were imagining things, but it seems that one floats differently — somewhat effortlessly — in spring-fed waters. Luna’s long hair was silky smooth, and we all felt … well … kinda high. Like happy high. Like not-a-care-in-the-world high. Buoyancy-encouraging, body-healing, endorphin-stimulating euphoria encouraged by mineral-laced springs. Welcome to Sky Valley. The happy mineral place — spring-fed pools and hot tubs at Sky Valley Resort. Desert Hot Springs, CA. Luna takes one of many daily swims in the pools. Sky Valley Resort, Desert Hot Springs, CA. 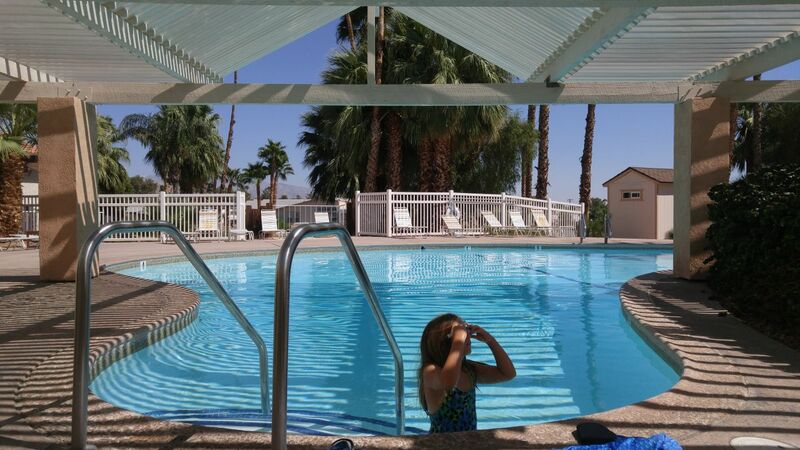 Meanwhile, we don’t really know what all the fuss is about Desert Hot Springs. Apparently, it is one of the fastest-growing areas in Riverside County, California, but to us it felt very unappealing. Lined with discount box stores and dining, it wan’t a place we wanted to return, even for sundry items. By all appearances, Desert Hot Springs serves many of the folks who are employed in swankier Palm Springs’ various resorts and kitchens. Hopefully Desert Hot Springs serves them well in return. Joshua Tree National Park was practically our neighbor at Sky Valley. If we had been able to walk across the street and over the mountain, we would have entered the park. Considering the heat and our seven-year-old’s abilities to hike, that was an impossible — and potentially illegal — task. Furthermore, the entrances to the park are one hour north and south of Sky Valley Resort respectively. With the heat, distance and timeframe, we never made it to Joshua Tree, but we hope to do it a destination on our next leg through California in winter. It should make for a much better experience. We did make it to Palm Springs, though, and it was loads of fun. 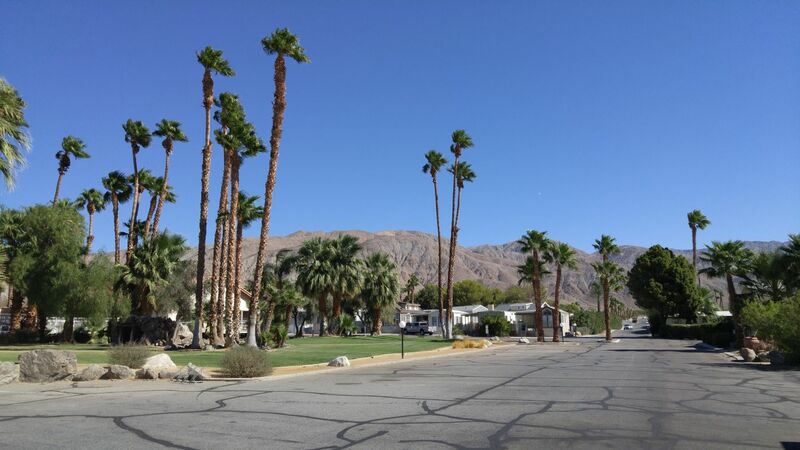 Palm Springs is world-renowned for glamorous living, potentially improved health, spring-fed spas, tennis, hiking, horseback riding, the Coachella Valley and Frank Sinatra. It is home to the largest gay community in the United States, as well as to the Agua Caliente Band of Cahuilla Indians. By sundown, it is shaded by Mount Gorgonio and the San Bernadino Mountains. But perhaps most famously, Palm Springs celebrates mid-century modern architecture, an exciting bit for sure for this family. 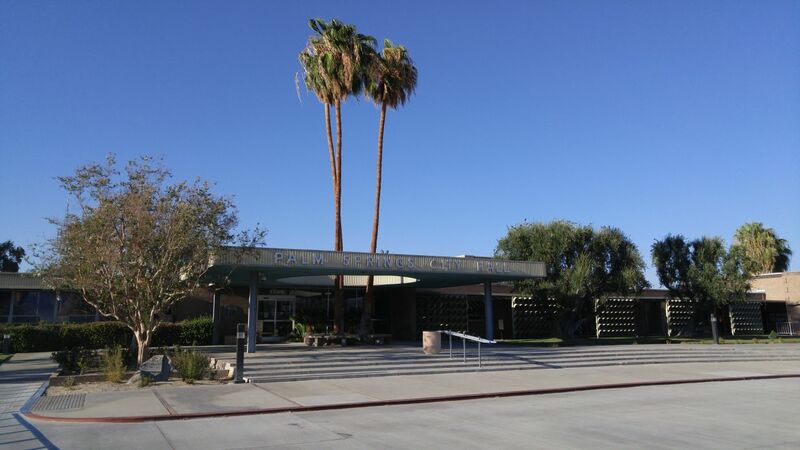 An icon of mid-century modern, Palm Springs City Hall built by Albert Frey and team in 1952. Sophia Apartments, Palm Springs, CA. 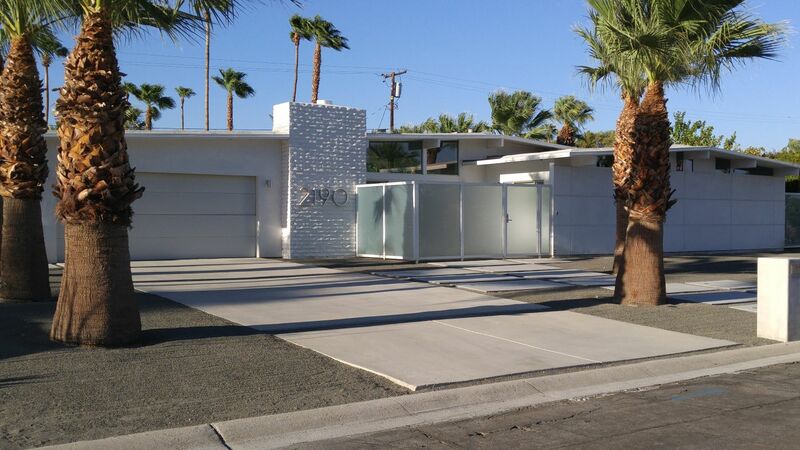 This gem, a mid-century modern home, Palm Springs CA. 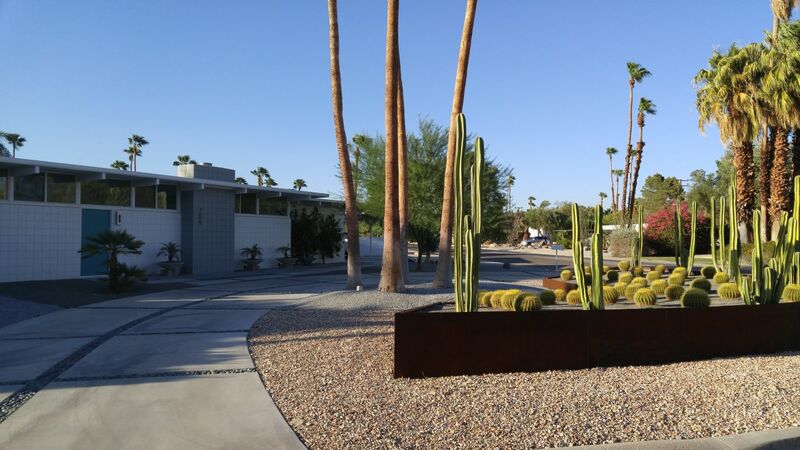 Outstanding garden and mid-century modern home, Palm Springs, CA. I was hoping to stop to see Frank Sinatra’s home; however, it is used for parties and other events at $2,000 a night, so I just imagined swinigin’ with Frank. 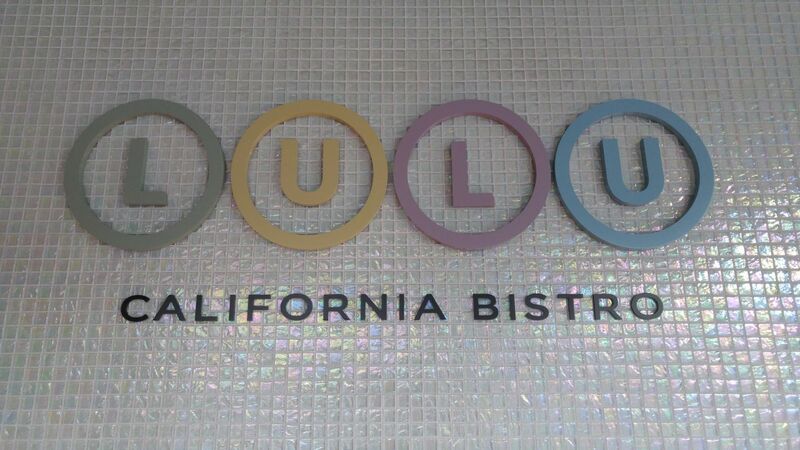 We did make it downtown after perusing neighborhoods and settled on appropriately-named Lulu’s for dinner, a happening dining hotspot with a Scottsdale, Arizona, vibe. 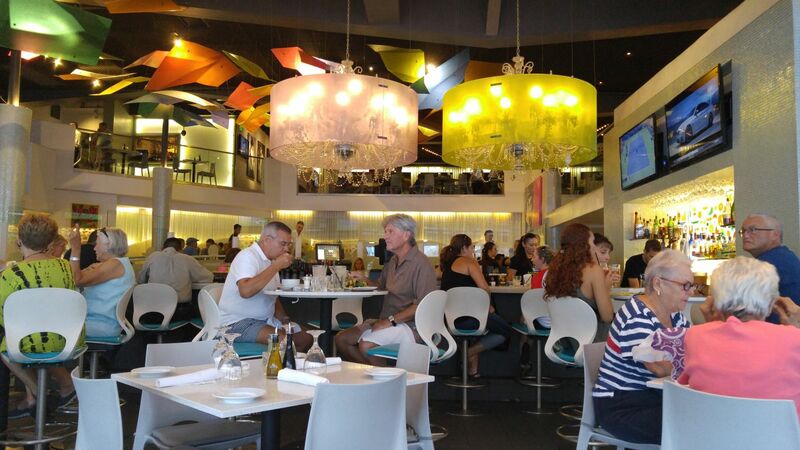 Easy to walk and browse, even in the 100-degree evening heat, Palm Springs is a fun place to be. 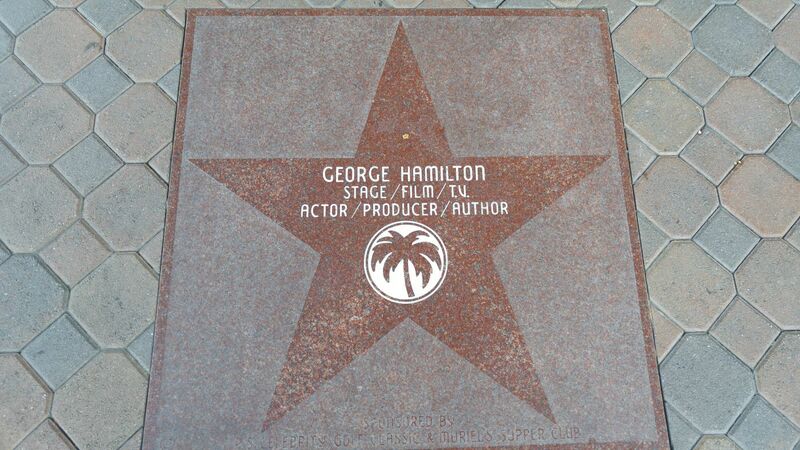 Where the Boys Are and Fantasy Islands’ George Hamilton’s Star. Downtown Palm Springs, CA. It is funny to me how folks find little pockets of peculiar places to live in the world. The Coachella Valley does not rest near the coast, nor reside among tall pines that offer cool shade and comfort. It is not easy to get here, nor is it easy to live here. It is in the middle of nowhere; it is extremely hot a lot of the time and often windy, but the bubbling subterranean springs made the call to people who sought something else, something more and a little different. It is weird in a way. We can see how one has to keep calm and build relationship with the desert here, how folks might just want to call this region home and how desert rockers could make a sound all their own. It is isolated and unique. Palm springs is charming and quite lovely and we are sure that we shall return here again someday. Winter and spring in the Coachella Valley are probably quite delightful. We look forward to Joshua Tree National Park. Sky Valley, so eerily quiet yet busy with wind and community, was a pleasant experience. It offered much more than we anticipated upon entering. There will be more to report. In the meantime, we had a good time. It was a great end to our mini vacation. Someday, you might want to check it out! Your photos are always so magnificent. I enjoyed this entry because we have traveled some in that area, as well as Arizona, and I have come to love the desert, and almost feel as if I was meant to live there. (It’s not going to happen in this lifetime because I am not going to leave my family behind and they don’t want to move there.) I love everything about the desert–the vegetation especially. I don’t miss grass or leaves at all when I am there. I am sorry you did not get to Joshua Tree NP but I hope that you will on a future trip. I fell in love with it at first site. I knew I was going to see lots of Joshua trees, but had no idea of the rocks and rock formations, and that it is a popular spot for rock climbers. Luna will love it! Safe travels. I love living vicariously through your family’s travels! I can feel the spring water and truly your writing wants me to experience in the flesh. The pictures from Palm Springs look like a movie from the 50’s! We are excited to go to the Grand Canyon some day! Happy travels and more life experiences! Love it! Yes, I totally imagined the glamorous life of the ’50s in Palm Springs. They are doing their thing there certainly. Thank you for all of the compliments! The Grand Canyon will be next, so stay tuned. Much love to you. Love this piece and the photos! I have a new outlook on the desert, really. Not sure I’d appreciate that heat but the views-spectacular! We do love the desert. The heat this year is a little much; it’s been with us for awhile. 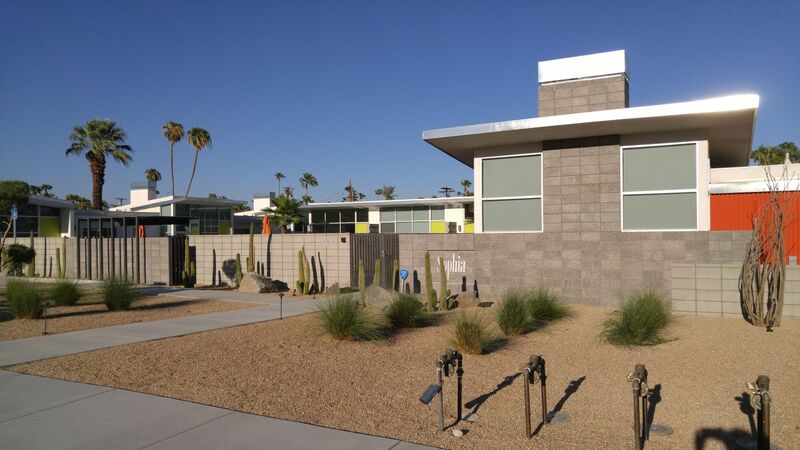 But we LOVED those modern homes in Palm Springs. Hopefully I can write up Scottsdale/East Valley just as much. Love to you. Thanks for reading. Would like to hear what your friends say. I think you’d enjoy it. Great landscape. Very inspired for a travel blogger like me. Tks for making this article.